It’s a perfect day for some Great Craft Beer! 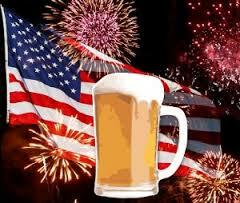 We will be closed on the 4th so come in and pick up 16oz 4 packs for $10.00 or a couple Growlers for the Holiday. Guaranteed you will be the hit of the picnic tomorrow! HAPPY BIRTHDAY AMERICA! Remember, Most of our fore Fathers were Craft Brewers!